Warehouse OptimizationRF | RTC Group, Inc.
Do you find yourself struggling with inefficiencies in your current JDA® Merchandise Management System® (MMS®) warehouse processes that are driving you nuts? Imagine the impact a 55% increase in productivity could mean to your bottom line? The engineers at RTC Group have developed a powerful module that can help you reach these numbers and escape the clutches of your paper based environment. We are the "MD of Retail IT" and we bring you our Warehouse Optimization RF Module, the answer for retailers looking to fully optimize their JDA® MMS® investment with RF technology for increased productivity, accountability and accuracy. According to a report by Datalogic Mobile, Warehouse professionals worldwide reported that after installing a wireless optimization system, they recognized a reduction in the time used to process inventory of 25.10%. 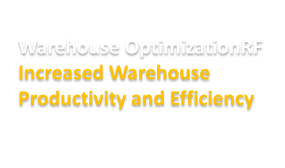 One of RTC's customer's increased their warehouse efficiency by 55%.